May 25th UPDATE: The Playgrounds are Finished! Refinished swing, new bench & trash can, new fence, new sandbox, and new play structure with slide & swing. We are very proud to announce that our three neighborhood playground-parks are finally completed and officially open! After several frustrating delays due to weather and the “human factor”, followed by long hours slopping colorful paint onto wood alongside neighborhood volunteers; we held three opening ceremonies, cut three ribbons and watched the kids have fun. One of our young neighbors began to play in the new sandbox as soon as it was possible. We would like to pass on to you all the gratitude the people of Sofievka have expressed to us. We can’t thank you enough for your contributions to our humble little project. As much fun as it’s been, we’re relieved to be finally finished – especially since our Peace Corps service ends in only a week! April 3rd UPDATE: We’re treating the wood to prepare the playgrounds for installation. Read about it here. March 2nd UPDATE: Building is well underway! Take a look at this blog post for details. January 4th UPDATE: The “Our Sofievka!” project has been fully funded! We have been overwhelmed by the support we’ve received from our families, friends, and even complete strangers who have contributed to this project. Thank you so, so much for your help!! We should have access to the funds within a month, at which point some preliminary work can begin. The bulk of the project—installing equipment—won’t happen until the spring, but we expect everything to be ready to go as soon as the ground thaws! 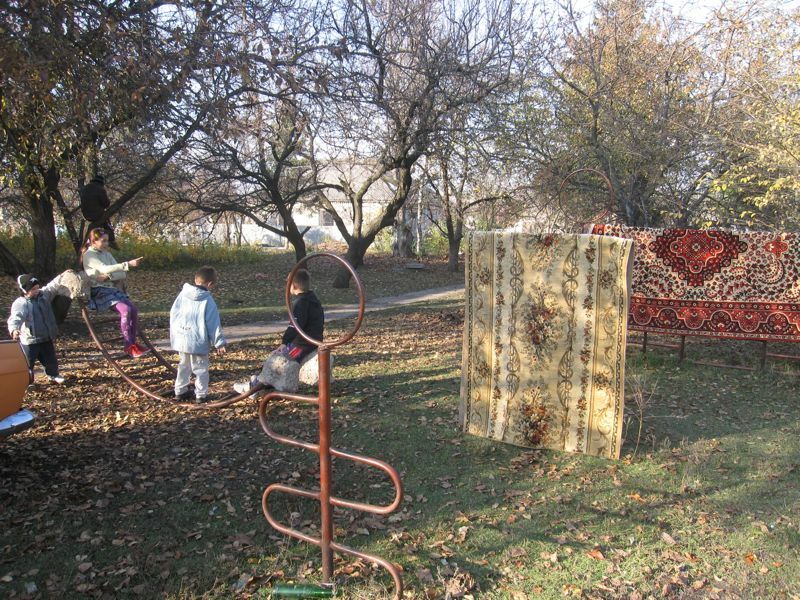 Now, read on to learn all about our exciting project “Our Sofievka: Parks, Playgrounds, and Peace”! 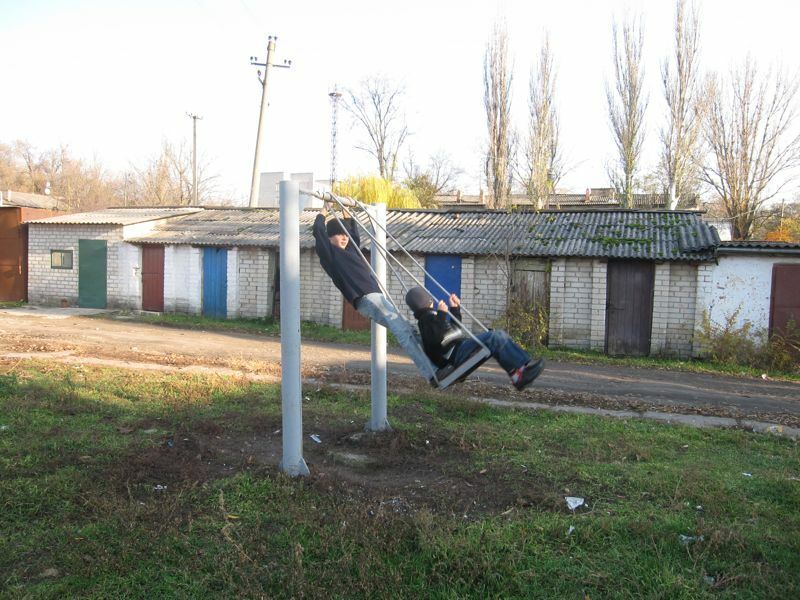 Resourceful Sofievka kids turned these broken monkey bars into a teeter-totter. We have been incredibly fortunate to live in such a friendly Ukrainian town for the last year and a half. The people of Sofievka embraced us, took us in as their own, and did everything possible to make sure we were always comfortable and safe. In our last few months here, we would like to do something to give back and show them how thankful we are. We can’t do it on our own, however, so we’re asking for your help. Although most residents agree that Sofievka is a wonderful little town in which to live, all believe that there are too few places for people—from small children to elderly retirees—to relax and enjoy time outdoors. The town is just too poor to spend much money on recreational spaces. Our goal is to revitalize small parks near three apartment complexes. Each park will include playground equipment, benches, and trash cans. Over 2,000 Sofievka residents will benefit from this project—families in more than 900 apartments—and we believe that it will make our town a more pleasant, more enjoyable, and safer place for all to live. 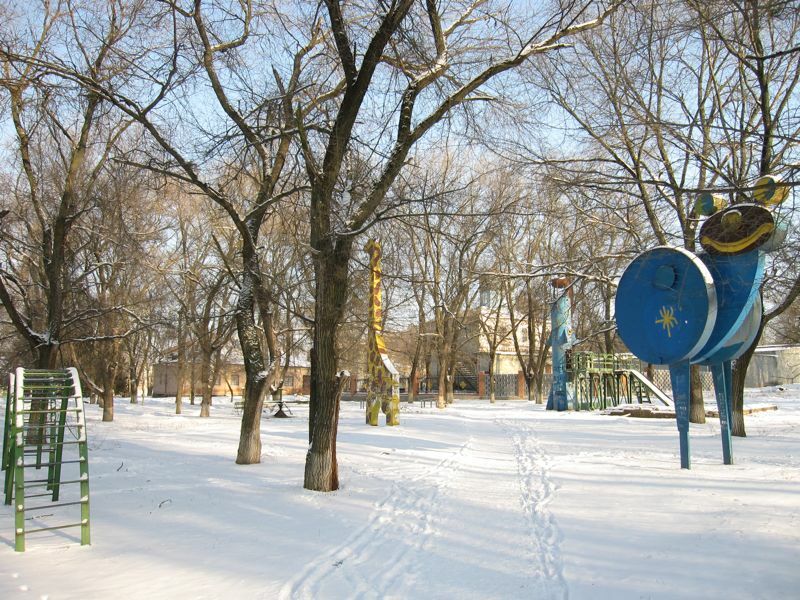 We’ve named the project “Our Sofievka: Parks, Playgrounds, and Peace” since we hope it will make everyone feel more proud of and more engaged in our little town. Alex makes plans with our Community Partners: a local carpenter, the mayor, and Tanya, a member of Sofievka's volunteer youth organization. For the project, we raised just under $3,700 from our family members, friends, and supporters. Our goal was to raise all the money by the end of January (done! 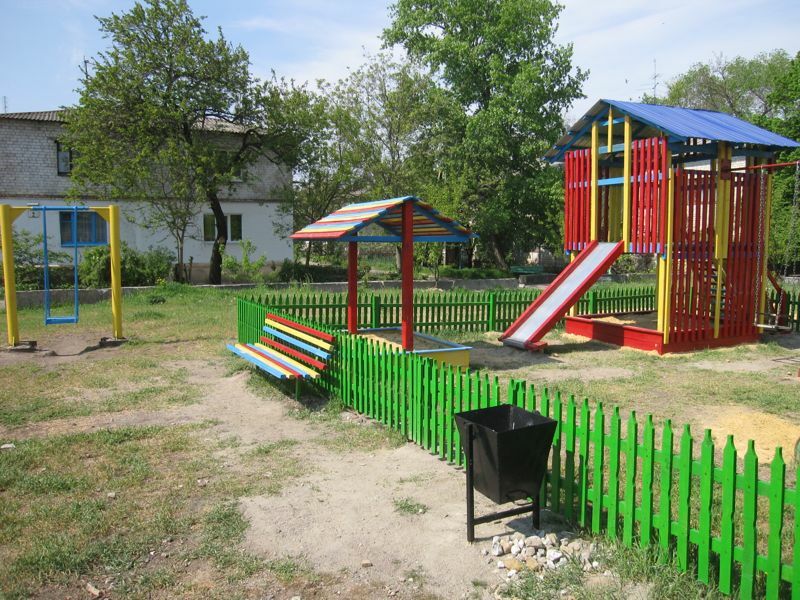 ), then finish the project by the end of April, so that the playgrounds and park areas will be ready for Ukraine’s beautiful spring and summer weather. 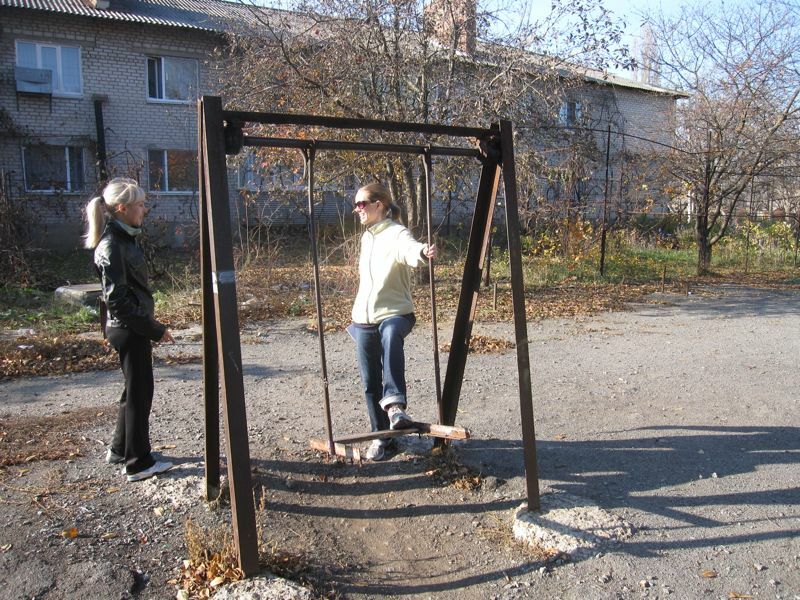 We can offer multiple options for levels of giving, and we’ll send each of you a thank you card featuring authentic Sofievka kids posing on (or throwing trash into) your donated equipment. 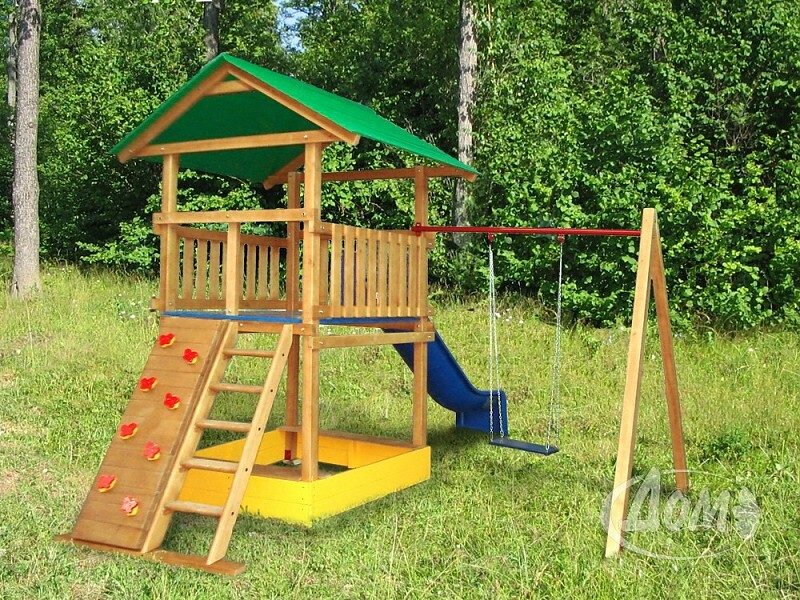 Our local carpenter will build new playground structures similar to this. Every gift is appreciated, so don’t worry if you’re on a tight budget. There is a giving level for everyone! Additionally, donations can be made in memory or honor of a loved one. We will send that person a nice email (a letter will be too slow) with some pictures to let her/him know about your donation, and we’ll send a card when the project is finished. Please note that we won’t receive a list of donors until March, so send an email if you want us to know about your donation sooner, or if you want to honor someone with your gift. Peace Corps can even process matching gifts from companies if you’re so inclined (details here). THANK YOU!!! This old play equipment will be painted and given a second life. Our new playground/park area will be located just behind the trees. For a taste of Sofievka, check out a few of our old blog posts, and flip through our photo albums. To read more detailed information about the project, click on one of the sections below. Feel free to contact us for more information, such as the project budget. Like many small towns, Sofievka is a good place to raise a family. This Ukrainian farming community, surrounded by vast sunflower fields, remains friendly and welcoming in spite of the economic and political instability that persists in the post-Soviet era. Residents enjoy strolling the pedestrian-friendly lanes in this quiet town, greeting each other and watching the seasons change. This old rusting slide is becoming dangerous and will be replaced. The butterfly monkey bars will be repainted. However, Sofievka has its problems. Employment is hard to come by, litter goes uncollected, and recreational opportunities for families are sparse. Many community members have expressed the need for safe public spaces for adults and children. The “Our Sofievka: Parks, Playgrounds, and Peace” project sets out to improve the quality of life for residents and keep Sofievka vibrant. It will accomplish this in a small way by creating safe and attractive public spaces where residents can socialize and children can play together. To achieve maximum impact using available resources, the project will revitalize three existing playgrounds and neighborhood parks, impacting over 900 families. Funds will be used to build playground equipment, benches, and trash receptacles. Additionally, some existing equipment will be repaired and repainted. All labor and some materials will be donated by volunteers from the community, especially nearby residents, giving them a sense of ownership over the new spaces. 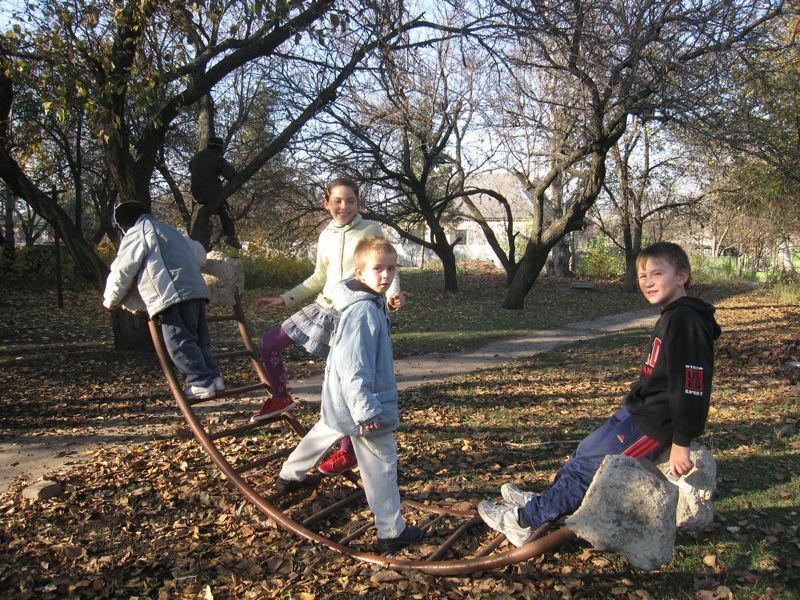 Your contribution to the “Our Sofievka: Parks, Playgrounds, and Peace” project will help build the bond of friendship Ukrainians here feel towards the US; a friendship we experience daily through the generosity and open arms of Sofievka residents. We, and the people of Sofievka, thank you sincerely. Sofievka is a small town between two large cities (Kryvyy Rih and Dnepropetrovsk) in central-eastern Ukraine, located on the steppe among vast fields of sunflowers and wheat. The town has a population of around 10,000, plus many more who come from surrounding villages on weekdays for business and shopping. There are two secondary schools in town, one professional school, and several day care centers. A wide diversity of ages is represented in Sofievka. Most residents agree that it is a nice place to raise a family, although lacking in safe public spaces for adults and children. Many citizens work as farmers, as local government employees, or in the service industry, however unemployment in the area is high. There is not a single large employer in the community. Over 900 families live in apartments located in three neighborhoods in Sofievka. Each neighborhood has a small playground/park area, but these are currently run down. Sofievka's "Central Park" features a giraffe and a rocket, recently repainted by some of our community partners. 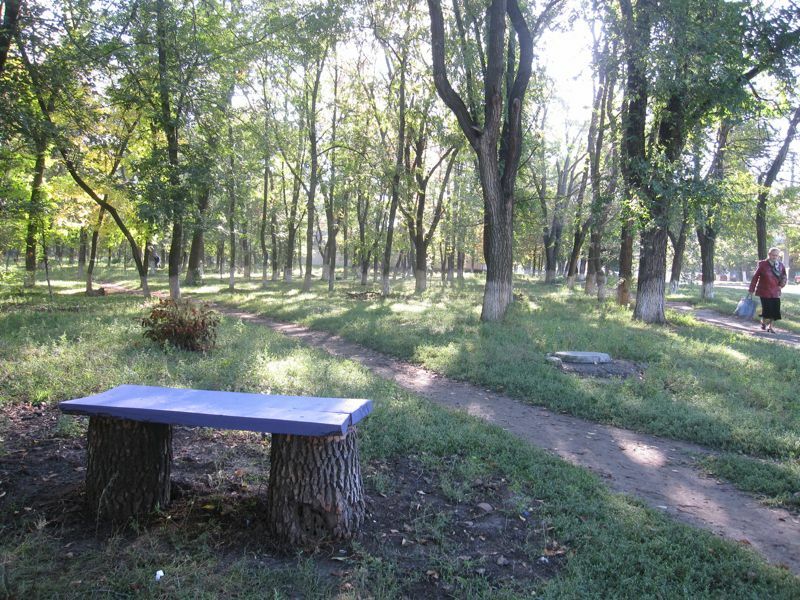 A small organization of young adults in Sofievka called the Regions’ Youth Organization has recently begun volunteering to clean up and repair public spaces to make the town more beautiful, comfortable, and safe. 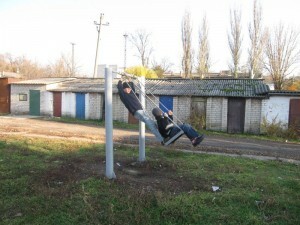 For example, they took the initiative to clean up a small playground in the center of town. They repainted equipment vandalized with graffiti, fixed broken swings, and repaired a large sandbox. They assisted in the design of the project and made necessary contacts with the Town Council. 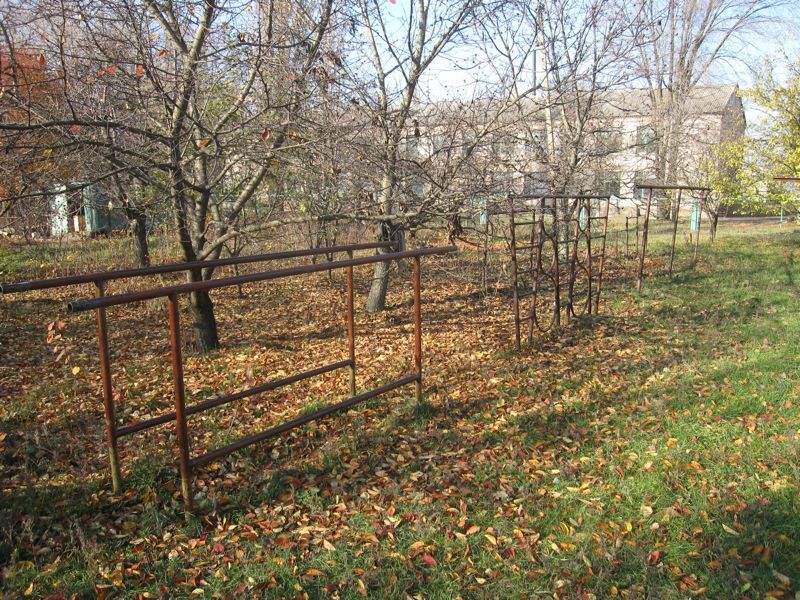 The Town Council will lead the implementation of the project, and members of the Youth Organization will volunteer their time and energy by repairing, installing, and painting equipment. Emma and Tanya discuss plans in the neighborhood where we'll build a park. Sofievka is a small town with few resources or recreational opportunities for residents. 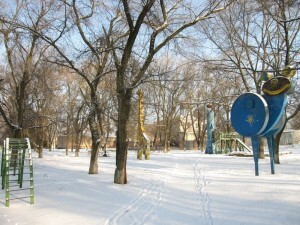 Typical places of recreation, such as movie theaters, bowling alleys, nature parks, etc. are not available in Sofievka. The town is located between two large cities, but most residents don’t have the financial means to travel there for recreation. Local sports teams, music and art activities, and even a discotheque target primarily school children and teenagers. Most people, young and old alike, have little to do outside their homes besides walk around town, possibly sitting with friends on the stadium bleachers. As a result, many feel cooped up with few opportunities to relax safely outdoors. Energetic young children, stay-at-home mothers, and retirees are particularly affected. The goal of this project is to provide all Sofievka residents with safer, more comfortable public places. Playground equipment, benches, and trash cans will be purchased and installed within three neighborhoods, where over 900 families live. 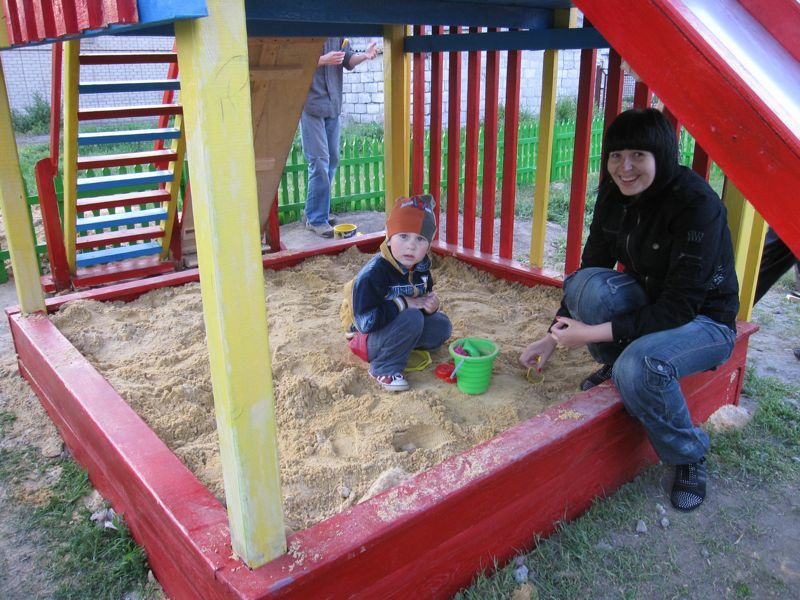 Without this project, Sofievka’s children could be injured on unsafe playground equipment, youth could turn to risky behaviors, and young mothers and retirees could experience depression with little to do but sit inside alone day after day. In addition, young families may decide to give up on Sofievka altogether, leaving for a larger city better equipped to deal with their needs. The “Our Sofievka!” project is necessary to keep the community vital and attractive to all residents. During our community assessment, we approached numerous community members and leaders with the question: What kind of small project can we do to improve life for all Sofievka residents? All of them agreed that we should do a project to increase and improve public spaces in town. They are all excited to get a project like this going, so that they, their children, parents, neighbors, and friends will have comfortable public places for recreation. 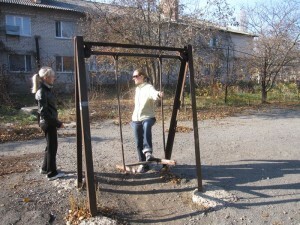 Sofievka residents want to improve their town. Some volunteers recently built low-cost benches in the park. After discussions with the Regions’ Youth Organization, they originated the idea to focus our project on three neighborhood parks: painting existing and bringing in new playground equipment, providing benches and picnic tables, and purchasing trash cans. This organization is the driving force behind the project: they planned the project and put together the budget. They contacted the Town Council, which embraced the idea and agreed to implement the entire project. Council members will arrange for the clean up of the sites that will be used for the parks and for the purchase and installation of equipment. Youth Organization volunteers will organize “work days” with neighborhood residents to prepare the sites, repair and paint old equipment, and do final touch ups. At the end of the project, the PCVs will enlist community members’ help to hold “grand openings” of the parks for all neighborhood residents. Kids come far out of their way after school to play on the teeter-totter in our backyard. Our partners, the Regions Youth Organization and the Town Council, as well as local neighborhood residents, will contribute many hours of labor to install and prepare the equipment and park areas. The Town Council will work to clear out and clean up land that will be used for the neighborhood parks. This will involve removing brush and trees, moving trash, and possibly grading land. After the equipment has been installed, they will transport sand to the sites, providing trucks and gasoline. 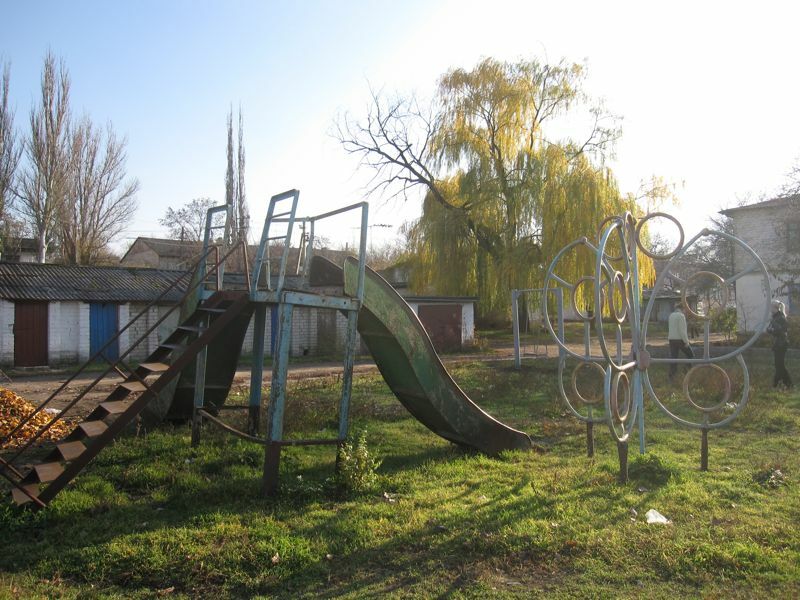 Additionally, the Town Council has already provided UAH 6,000 in cash to cover the necessary bank fee and pay the local carpenter to purchase wood for the playground structures. All told, the community will contribute over 25% of the total cost, showing their commitment to the success of the project. We have already received approval and support from the Town Council in order to implement this project. Members of the Youth Organization will continue to work closely with members of the Town Council to prepare for project implementation, while we raise money for the grant. This preparation work will ensure that the project is ready to begin as soon as money is available. This playground area will be revitalized with new structures, a fresh coat of paint, benches, trash cans, and a real teeter-totter. When funds become available, the Town Council will order the equipment. Meanwhile, Youth Organization volunteers will assist us to plan, publicize, and carry out neighborhood workdays at each site. This first round of workdays will be focused on cleaning up and preparing the sites. The Town Council will take care of heavy lifting such as removing trees and piles of trash, and they will grade the land if necessary. Our community partners will install the equipment when it is delivered. At this point we will hold a second round of neighborhood workdays to paint new and old equipment, and finish the sites. Finally, our community partners will help us to work with neighborhood and town leaders to plan grand opening ceremonies at each site. The ceremonies will include short speeches, games and activities for children, and snacks and drinks for all. 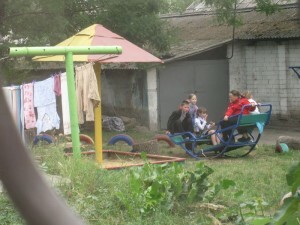 The kids of Sofievka will make good use of their new playgrounds. This project will give valuable experience to our community partners in project design and management. Our partners are a group of young adults who are poised to become leaders in the community. They have few opportunities to undertake projects such as this due to a lack of funding, and so this is a perfect chance for them practice and learn the key concepts of community organizing and volunteerism. The two rounds of neighborhood workdays are also a crucial aspect of the project in terms of sustainability. Neighborhood members will donate time and labor to prepare and finish the sites. This will give them a sense of responsibility for the project and a personal incentive to take care of the new community spaces. Grand opening ceremonies will also help instill pride in the spaces and establish community ownership. The new equipment should not require much maintenance, and the community has demonstrated an ability to maintain similar sites in other parts of town. Neighborhood residents will empty trash bins as they fill up, an arrangement that works well at other sites in town. Finally, the Town Council has agreed to repair and repaint the equipment as necessary. I just read your blog on the iContact blog! I’m so excited that you both are still enjoying your positions with the Peace Corp. I’m also really excited to see iContact’s money going to such a worthy cause. Great work you guys! Keep it up! Pingback: emmaandalex | Playgrounds in progress! I love it, Emma and Alex!!! I’m so proud of you. 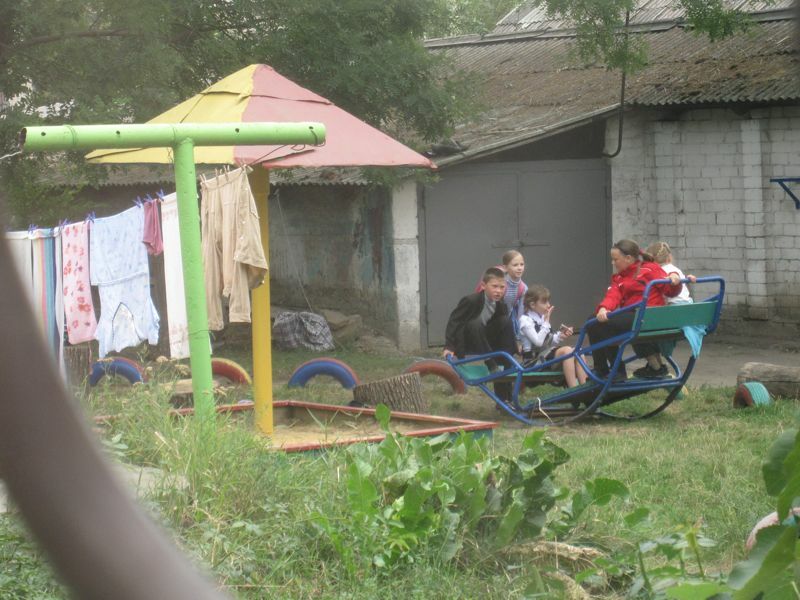 May the playgrounds engender peace within the community, among families, within families, and between Ukraine (your little corner of it) and America. Pingback: emmaandalex | Merry Christmas! I love it, Emma and Alex!! !